I recently ran into a dilemma when helping a friend buy a new computer. She had bought a computer, on my recommendations, and all it came with was an OEM version of Windows XP. Obviously, I was obligated to hook everything up, and install all the necessary software. Normally, I would recommend a few commercial products which I would then buy and install, but in this case, budget was tight and so I had to resort to using only free software. To my surprise, what I found was that there are so many free alternatives to good software that there is really very little need to spend a huge amount of money (or any money) and still get a secure and fully functional computer. So your new computer is plugged in, you've set up the ADSL or cable connection and you are ready to head online to get our free software. But to do this, we will have to venture online, and this means danger. Danger from trojans that sit idly on web pages, ready to strike. Danger from hackers looking for new computers to hack into. Dangers from emails claiming to be from your bank asking you to immediately login to your online banking account or all your money will be gone. The Internet is a scary place for a new computer (and I see the irony of having to go online to read this guide in the first place - hopefully somebody has printed you a copy, or you have access to another secured computer). 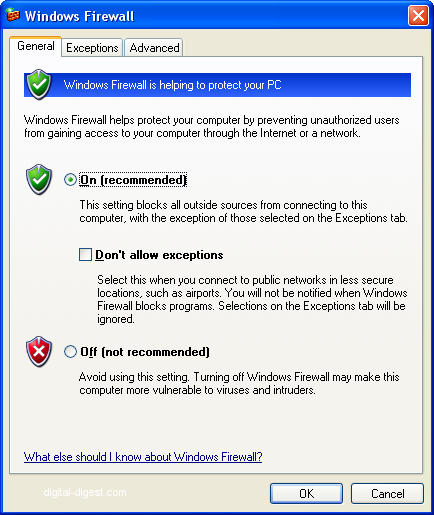 So the first thing you should do, apart from disconnecting your computer from the Internet, is to at the very least enable Windows Firewall. Windows Firewall comes free with Windows XP and above, and it is really the first line of defence for a new computer. A firewall does what it sounds like, to put a barrier between your computer and all those people and zombie computers attempting to hack into your system. Windows Firewall is not the best personal firewall around - it doesn't protect you from outbound traffic for example - but it's there already, so click on the "Start" button, go to "Control Panel", click on "Windows Firewall" and enable it. Your computer is now at least somewhat protected from the Internet (so plug back that network cable). We will be talking about security a few steps later in more detail (and most likely, won't be using Windows Firewall to protect ourselves), but we are somewhat safe, for now. You should now run Windows Update (Start -> All Programs -> Windows Update) to get your Windows patched up with the latest security fixes. There should be quite a few, and it might take an hour or two, and a few system restarts, to get everything patched up. Don't skip this step though, because old OS vulnerabilities are the first things hackers try to exploit and can render all your other security measures useless.